Cast: Yeon Woo Jin, Park Hye Soon, Yoon Park and Kong Sung Yeon. Eun Hwan Ki (Yeon Woo Jin) is an introvert unable to look people in the eye. He has a hard time communicating, and spends a lot of time contemplating about what to say in order not to hurt people’s feelings. Due to that nature, being a CEO is impossible for him as he is unable to stand in front of a big crowd and say what is on his mind. His best friend Kang Il Woo (Yoon Park) on the other hand is an open and charismatic man, who does all the social interactions instead of Hwan Ki. Unfortunately, Hwan Ki is the more competent CEO, but due to his personality he is unable to show is, and Il Woo gets all the credit. I really liked this drama because of the theme – anxiety. It is something that is taboo in Korea, so them doing it in a sense of humor made it great to see. I laughed so much and I felt sad, so I believe that the drama represents it very well. Yeon Woo Jin is amazing in this drama, and he makes it so believable that I don’t think anyone else would have done such a great job. The rest do a superb job, which makes it even better. Though I enjoyed the back story at the beginning, it started to get ridiculous later, and especially the twist at the end made me annoyed. Also, the final scene was cute, but just completely different than what this drama was supposed to be. I mean Chae Ro Woons character went a 360 degree – I don’t want to spoil, but it was just a complete change of character. Which made the overall irritating, and didn’t make sense. 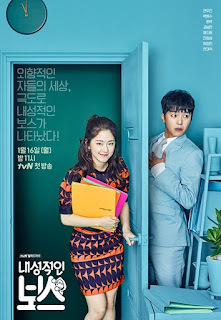 Anyways, a funny, cute and well-acted drama that I would recommend!